I keep on falling in love at AfrikaBurn. Now sitting behind my computer, midyear through tax returns and a full diary, back in the default world I am reflecting on those moments of Love and Magic. It helps me keep my left, focused brain on track by reminding myself I have a right, creative, intuitive side…. recalling Prometheus. The first trip was scary as hell on some levels…. to reach the stars and dance with the angels you have to befriend many devils. So, I guess after that first journey I fell in love with a new life: my own. With much less clutter and holding backs; I cut loose and let my hair down – and found a tribe where I could be me. I came home to myself. I danced through the last night with a new rekindled love in my heart seeing the sunrise burn of O to celebrate a new dawn. On my second burn it was more a quiet kind of love affair. I flirted with dressing up and had a ball of a time with my small-clan-within-the-clan doubling in size. I fell in love with the dust and the wind – there was a special moment when it ripped a paper out of my hand and danced around me. Such a joyful intimate moment where me and wind disappeared into lekker being on the hot playa. I fell in love with the sunsets when the clan would be pulled to the west and cheer as the big ball of fire would set behind the far mountains. I fell in love with the stars and the rocks and the fire… It was a time to be surprised by the most basic stuff: sleep, movement, a cold block of ice, early morning coffee, a simple beautiful beat finding its way to your ears at the right moment to move you into new aliveness . . . .
Love 2.0 (introduced by Barbara Fredrickson) is an understanding of love as a particular moment in time, defined by a mutual resonance – a momentary feeling of being totally connected and alive. It is different to our understanding of ‘long term love’ or ‘partnership’ or the Hollywood-like myth of boy-meets-girl-lives-happily-ever-after. Love can be experienced in many different moments, with different people or things. It reminds me of the Spanish word ‘vivencia’, a concept I learnt in Biodanza. Broadly translated it means something like ‘a fully lived moment’ where as many senses as possible is engage in connection to feeling alive; a uniquely creative and expanded moment. Bring those moments on – I need them to survive this life! My third burn brought me falling in love with art, with creations and with artists. I had many moments of magical connection. This year saw a gear change in lighting and using night time and technology to colour the artworks. Step aside strobe lights, here comes Fine art lighting. From the huge Clan being covered in different patterns to a magic eagle flying around the playa lit by a single light… What definitively stole my heart was magical creature Molly the Mollusc’s new nest buddy Prometheus. Not only mine…. many a time I found people lying flat on their backs in the dust mesmerized by the giant Butterfly’s transforming wings. The sheer beauty of it boggles my mind and took my breath away. In Greek mythology Prometheus is the Titan who created man from clay, and then defied the gods by stealing fire and giving it to humanity. Zeus argued that man was not yet ready to receive the power of technology and would not use it wisely. Prometheus disagreed, having faith in his creations. He paid for his disobedience by being bound to a rock while an eagle came and ate a piece of his liver every day. The liver grows back every night and represents human emotions. The quest for knowledge can lead to tragedy. It makes you think. What are we doing with our technology today? Here at the Burn we create for the sake of creating. Aside, on creating art at the burn: see the inspiring TED talk by Nora Atkinson on ‘Why Art is Thriving at The Burn’. I was wondering how the creators of such a beautiful creature thought about giving it this name. “Zaheer initially approached me about creating a friend for Molly and over a couple of weeks we came up with various ideas but soon settled on one of the first , being a butterfly. We knew from the start it was going to be large , go high and be VERY colourful. We also knew it had to be ethereal/ transparent / filmy in some way. Once we gathered the team it gradually all fell into place. The name was Zaheer’s inspiration – it’s perfect when you understand the myth of Prometheus! Challenges were MANY – from mechanical design and construction issues ( My son Brian and I handled most of that ) to build site options , logistics , CASH , and , as always, running out of time towards the end. One great aspect that was never a problem was enthusiastic hands on deck for all the painting, 12 00 cable ties etc. They were BRILLIANT. IT WAS GREAT TO BE WITH SUCH A BUNCH. Shen and Drew, our lighting/ programming gurus were awesome to watch at work – all in an unintelligible electronics language! Probably the most stressful challenge was transport – 28 ton trucks are VERY expensive so load time was very tight and the two creatures have really strange , awkward parts – really difficult to pack (along with a camp for 30-odd Burners). The magic as it roamed with Molly on the Binnekring for the next week was UNBELIEVABLE! That’s what I have difficulty putting into words. The wide eyes of wonder , pure joy on faces , excitement of Burners taking a “flight” high over Tankwa are the gifts I’ll never forget! Yes, what a marvelous privilege to be part of a clan with weird and wonderful people and magical creatures! 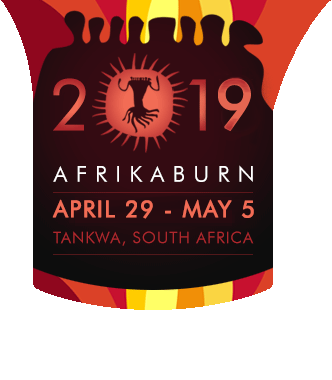 Next Post: Of cogs, fire and quanta: Steampunk at Afrikaburn 2018?